Consumption of Omega 3 fatty acids results in reduced deaths due to coronary heart disease* (*U.S. Government studies). Presenting a new and completely natural way to obtain the correct Omega balance so necessary to good heart health. An absolutely delicious, perfectly balanced blend of Extra Virgin Avocado, Olive and Flaxseed oils, carefully selected and blended to produce an optimal combination of Omega 9, 6, & 3 fatty acids, designed to keep your heart beating strong. Toss the fish oils and nutritional supplements! 2 teaspoons per day of this delicious oil will give you the minimum daily requirements of Omega 3, 6, & 9 fatty acids, all in the correct balance in an easily digestible and metabolized form. Also contains Vitamin E, Chlorophyll, Lutein, and Beta Sitosterol. 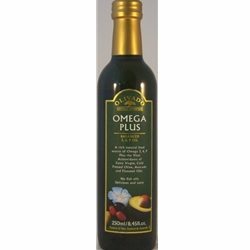 No fish oils, a rich natural food source of Omega 3,6 & 9 Oil, plus the vital Antioxidants of Extra Virgin, Cold pressed Avocado and Flaxseed Oils.